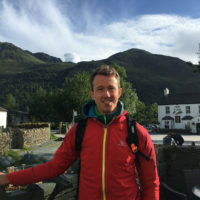 Ben Cottam and Giles Story walked the 285km section from Florence to Assisi, rather faster than recommended, over nine days in early May this year, armed with Rev Sandy Brown’s Cicerone guide. 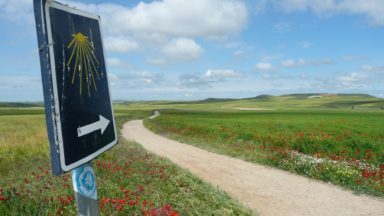 Here Giles looks at the more spiritual reasons for walking a camino. The son of a wealthy cloth merchant, in his early adulthood St Francis of Assisi eschewed his life of luxury, choosing instead Lady Poverty as his fair bride. 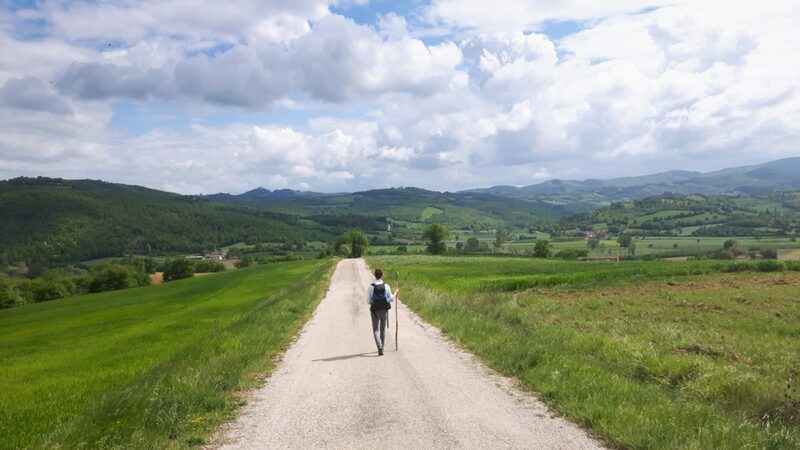 The Way of St Francis is a pilgrimage route inspired by his ascetic wanderings in the hills of Tuscany and Umbria. We picked up our pilgrim credentials from St James’ Episcopal Church in Florence on a Sunday morning, arriving just in time for Eucharist, a little worse for wear after a few too many Negroni cocktails the previous night. Father Mark Dunnam’s sermon seemed tailor-made: like vines, we are pruned back as we go through life. “I can never get over how far they prune them back!” he mused. 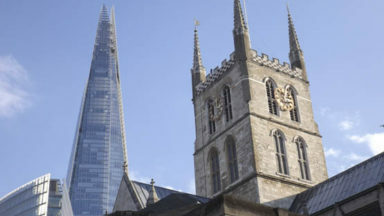 After the service, binding our hands with his cassock, he spoke a fluent grace to bless our departure – and we were off! The route ahead took us through sunlit vineyards, silver-green olive groves and miles of hushed woods. In May the weather was a perfect temperature for walking, and the fields and verges were colourful with wildflowers. Here are our top four spiritual reasons to make the journey. The Way of St Francis might get busy in high summer, and around the saint’s feast day in early October, but we can recommend it in shoulder season for its tranquillity. On road sections the odd Fiat Panda rattled past, perhaps bought new in 1991, but for the most part we saw no-one on the trails. Hermitages, monasteries and churches are dotted along the route, and it is easy to see why. 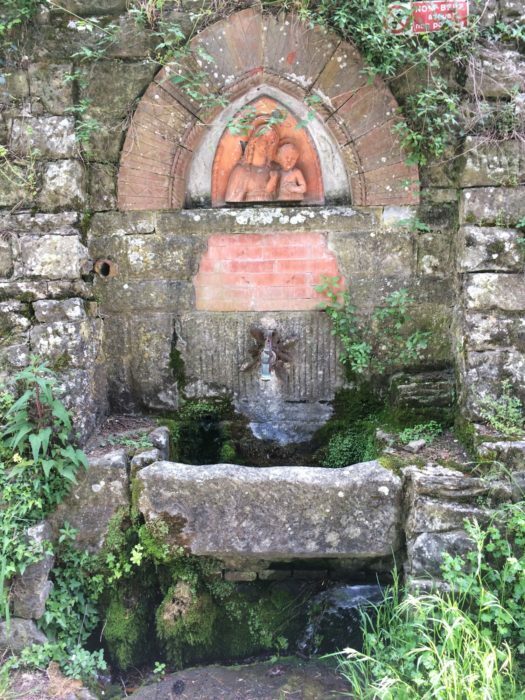 A favourite of ours was the Camaldoli Hermitage, founded by St Romauld just over 1000 years ago. 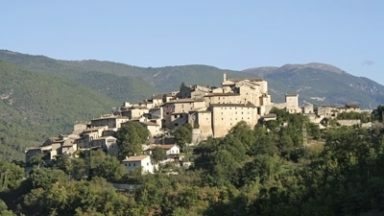 To reach Camaldoli, a relatively short day’s walk of 14km, we had set out at first light from our sleeping spot in some scrubland above the town of Stia. Blazing moonlight had kept us awake, continually prefiguring dawn. When dawn finally came, we set out through small pastures and creeper-strewn woods, dusted with the blossoms of cherry and sweet chestnut, to a tumbledown cottage, where we cooked porridge and brewed tea, sat among sprigs of applemint. We arrived at the Hermitage by noon and joined a tour in rapid Italian. The emblem of the Camaldolese order, which cropped up frequently on fountains and doorways, consists of two doves drinking from a chalice, symbolising the pairing of eremetic (solitary) and cenobitic (communal) monastic traditions. Beyond a fence were the stone huts where the hermits reside, mysterious men in curious, silent isolation. Luckily for us we were to stay that night in the guesthouse of the cenobitic monastery, rather than be confined to isolation. A run down steep corner-cutting paths through holy firs brought us to the monastery just as rain broke. 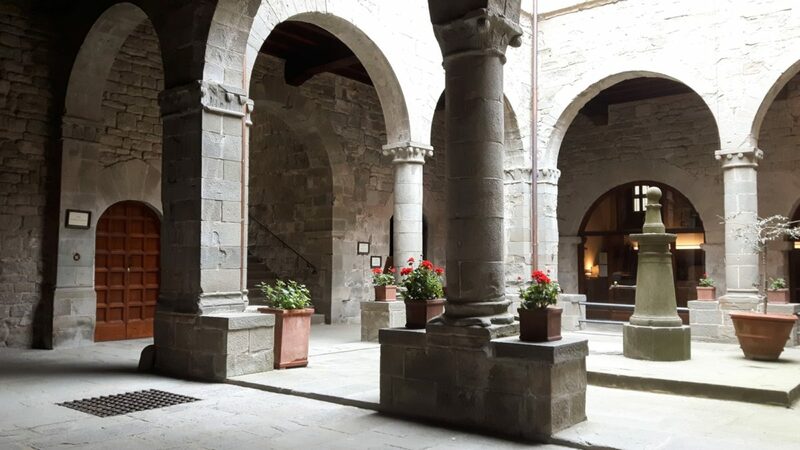 We sat in the cloisters for a time, where there was an all-embracing calm, a nourishing stillness after the road. We wondered how long those hermits had been in their huts up the hill, cut off from the outside world. Perhaps they were embodying on behalf of us all the need to spend more time in quiet contemplation, holding the world in mind. 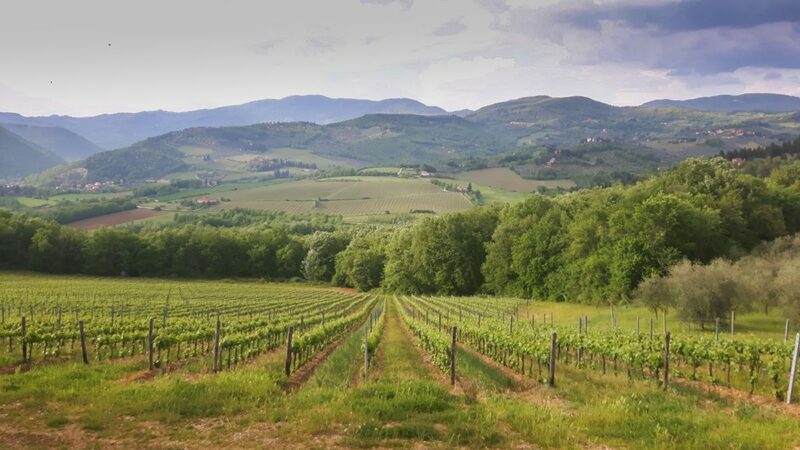 According to the European Commission, Umbria is 46% forest. Not surprisingly then, the Way of St Francis affords plenty of woodland walking, varying from mountain paths in lofty spruce and fir, to deciduous forest watered by bird song. 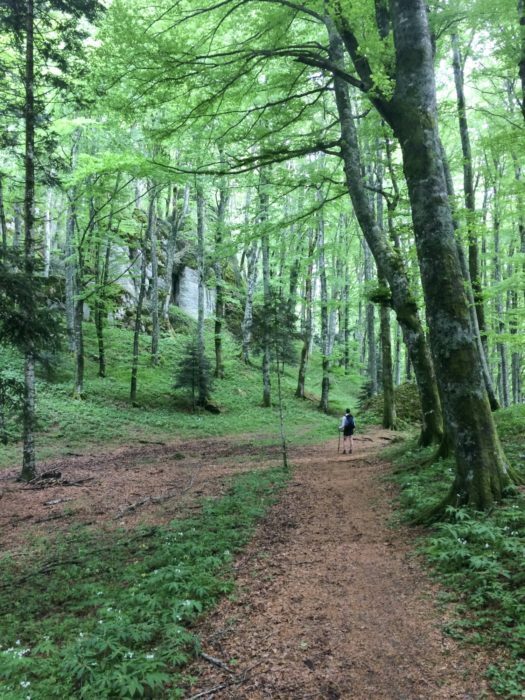 Approaching Santuaria della Verna, roughly halfway from Florence to Assisi, the path passes through mighty beechwoods, strewn with boulders covered in thick moss, like rich green damask. St Francis was known to have spent time in prayer and meditation there beneath Monte Penna, the mountainside having been given to him in the year 1213 by Count Orlando of Chiusi. It was there that he was reported to have received the stigmata, marks of Christ’s crucifixion. Walking through the woodland, we half expected to encounter him behind one of the larger rocks, which sheltered snow in niches and caves beneath. 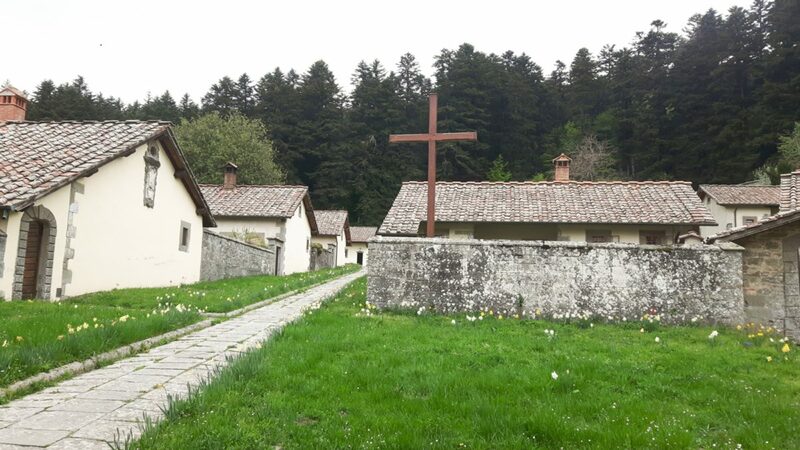 When we arrived at the broad cobbled yard of the Santuaria, where a tall wooden cross cut into the sky, thinly lit by sun through cloud, a nun, robes whipped by the wind, was taking photographs. We sat in the chapel, both subdued and joyful. An alcove holds ‘the cloak of St Francis’. Its curators clearly have not sensed any conflict at there being a similar artefact in Assisi (although I suppose Francis might have worn his way through more than one sackcloth in his lifetime). Nevertheless, this simple tunic was a fulcrum for thought. Alone, we explored winding passages of the convent, delving dreamlike into its holiest depths. There was a hushed solemnity about the place that, unlike the tourist-thronged halls of the Vatican, needed no enforcement by grouchy officials. It was strangely stirring. The museum in San Sepolcro, ‘town of the Holy Sepulchre’, houses The Resurrection by Piero della Francesca. The 15th-century fresco, which depicts Christ rising from the tomb, was described by Aldous Huxley in 1925 as ‘the greatest picture in the world’. His hyperbole was not vain: the painting was spared destruction in World War II, after a British gun commander named Tony Clarke, who had read Huxley’s description, ordered his troops not to fire on the town. 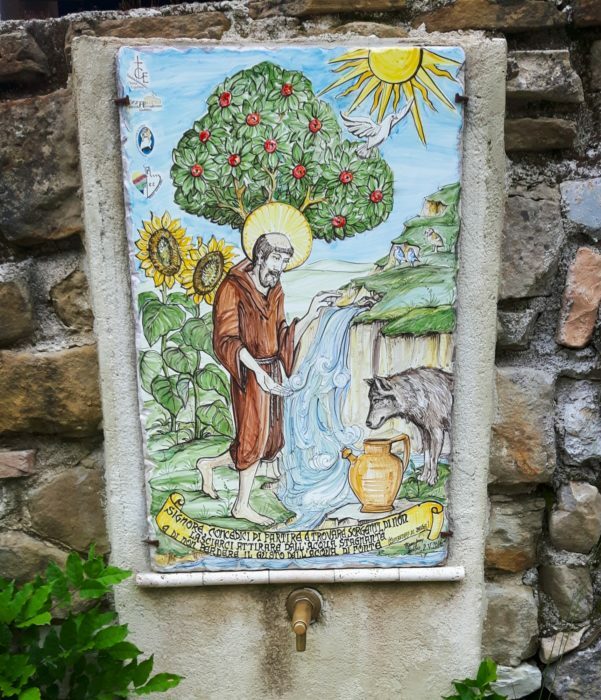 We walked from La Verna to San Sepolcro in a mega 41km day, which ended in a wet trudge on levee roads through fen-like flatlands, past ploughed fields, reed beds, sluice gates and reservoirs, where frequent signs warned of flood waves of biblical proportions. 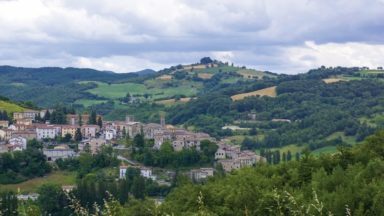 Earlier in the day, approaching the village of Formola, a grisly form in the bushes had turned into a boar, which squared up to us, bristling and tetchy. For a few seconds there was something of a standoff. Only when we stepped back a couple of paces did the irascible hog scarper into the hedge. We stopped off to look at The Resurrection the following morning. As we gazed at the painting we realised that it contained much of Dunnam’s sermon: Christ’s conquest over death symbolised by bare wintry trees on his left, and on his right the full-leaved trees of summer. We are pruned back but regrow, just like the vines, with greater vigour. 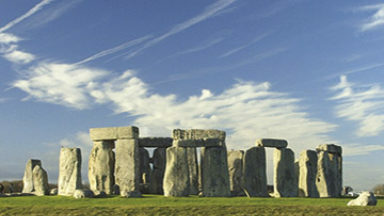 Several religious sites along the way offer lodgings for pilgrims. For us the best of these was at L’Eremo di San Pietro, our final stop before Assisi. We arrived tired, bedraggled and smelly, and unsure what we’d find there. To our surprise, three men wearing boater hats were milling around in the evening sunshine, one in a lemon-yellow sweater, singing choral music. ‘Buonasera! Are you pilgrims?’ came the cheery greeting. The three – Allessandro, Antonio and Cesare – were members of the Confraternity of Santiago Della Compostella in Italy. Allessandro, in the lemon sweater, showed us through a stone courtyard to our dormitory, and more or less insisted we have a shower before joining them for dinner – a tasty stew of meaty sausages, rice and bread, cooked up by Antonio. A fourth member of their household was Francesco, a handsome Hungarian sheepdog. 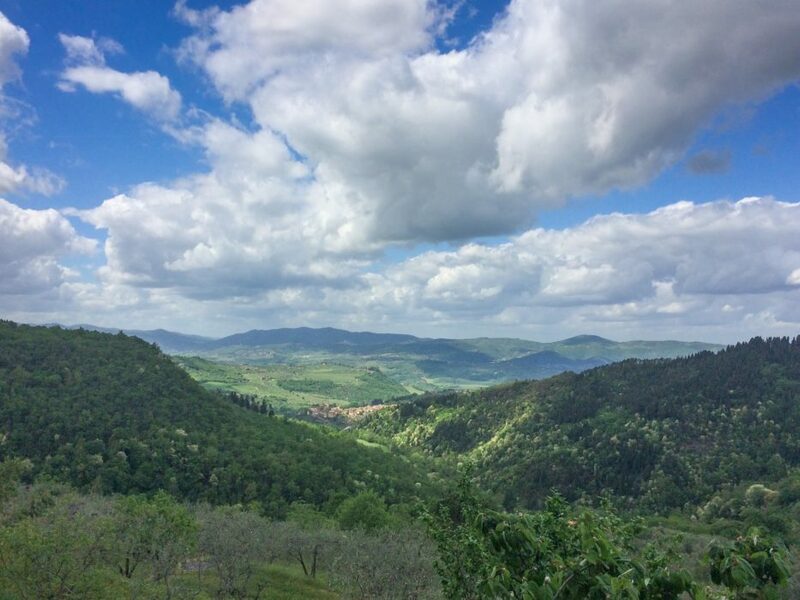 Wine flowed and we regaled each other in broken Italian and English with tales of the road – we told of our face-off with the boar and how two deer had almost leapt over our heads one afternoon as we sat down for a water stop. We heard, complete with actions, how Francesco had once disappeared for several hours on the trail of a stag, and how Cesare, after his career in an Italian punk band, had found Jesus, or rather, Jesus had found him. 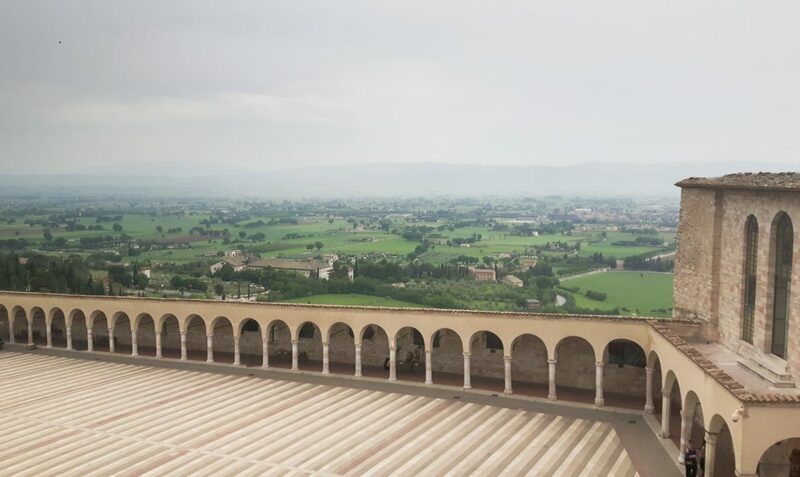 At our journey’s close, rain began to fall in large intermittent drops as we plodded insistently up to the gates of Assisi, more or less directly to the Basilica. At the forecourt of the great cathedral a nun ran past us, perhaps as excited as us to be there, but seemingly less tired. We sat in silence in the nave, which was decorated on all sides by frescoes depicting the life of St Francis, unsure what to do next. We had walked a long way, averaging 32km per day for nine days. In fact, we had done little besides walking, sleeping and eating. We had, however, as Pope Francis urged people to do in his first general audience, stepped outside ourselves, stepped outside ‘of a tired and routine way of living [the faith], of the temptation to withdraw into pre-established patterns that end up closing our horizon to [the] creative action [of God]’. This seemed to be what pilgrimage ought to be about – with every step a gradual falling away of everyday tasks and ambitions, the journey itself becoming the sole aim.